In terms of design, the Spin Genie Casino looks quite nice with the blue (heaven-like) background theme. The main page displays the full game offer. The site is dedicated to providing quality slots. The page will certainly appeal to people who aren't afraid to add a bit of adventure to their lives. The first-time visitors will likely be satisfied with the promotional offers that have been prepared for them. The promotions section mentions several specific deals that deserve their attention. A 100 % first deposit bonus awaits the new player. For example, a minimum deposit of ten pounds can be 100 % matched. A second deposit bonus of ten pounds can be 50 % matched. There is also a free welcome offer does not even require a deposit from the player. 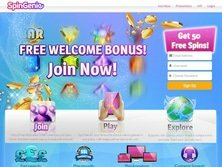 Fifty free spins are also provided here as well. However, the number of the available deals is small. But this does not take away from the quality of the deals that are on full display at the Bear Group Limited casino site. The Bear Group is a subsidiary of Gaming Realms, which in turn has been listed by the London Stock Exchange. There are several payment methods on the casino site. Making a deposit is really easy. The main deposit methods would include; Visa, Visa Debit, MasterCard & Maestro. A lot of the players from the United Kingdom come to the website. This isn't surprising. The casino's UK-based gaming services are licensed by the UK Gambling Commission. The casino website is also accessible to players from across the globe. The players who visit the website will find themselves in the same space with people from across the world. The English language is used as the support language at the site. 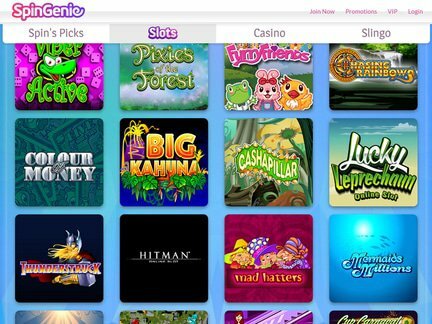 Certain games have received plenty of traffic from the visitors to Spin Genie Casino. Some of the titles have also ended up as the staff's picks; Starburst, Gonzo's Quest, Battleship, Dracula, Frankenstein, Jack Hammer, Blood Suckers, Zombie Rush. The standard casino games are included in the game offer; Roulette, European Roulette, Texas Hold'em, Blackjack, Jacks or Better, and many others. The collection of games is quite large and shows the casino in the best possible light, at least with regard to the availability of entertaining games. The security on the site is quite tight. The personal details of each player are stored securely on the server. There are some serious issues with withdrawals. This isn't a good thing for a casino which is still trying to establish its reputation. Some players have complained about the lack of connection with the casino staff. This is despite the promise of a response within 24 hours. Some caution would be advised when approaching the casino. The casino is regulated and licensed by the Alderney Gambling Control Commission while their UK services are licensed by the appropriate UK licensing body. I would not be comfortable with recommending the casino due to the increased number of complaints from players. The casino apparently refuses to process withdrawal requests from players. The withdrawals that do take place also take way too long. Therefore, the reputation of the casino is at stake. I am uncertain whether they will try to remedy the situation. I would be willing to give the casino a better rating for the interesting game selection. If they would simply resolve the conflicts that plague them and put more effort into creating a trustworthy brand, the casino could still have a bright future. Unfortunately, the current treatment of players can only work against the casino in the long run.